Life Before the Dinosaurs: Materpiscis. Materpiscis (mah-ter-PIE-sees) was the first animal ever to give live birth that has been discovered so far. 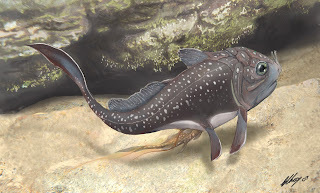 The one fossil of Materpiscis that has been found shows a smaller Materpiscis inside, but the smaller Materpiscis was not in the stomach, it was closer to the head than the stomach. They also found an umbilical cord attached to both the large Materpiscis and the small one. Materpiscis could crush a clamshell with its jaws. Materpiscis probably ate coral, sponges, and other hard-shelled invertebrates, but probably not arthropods because arthropods in the sea at the time were agile and quick. Since the one fossil of Materpiscis is preserved so badly, no one knows exactly what Materpiscis looked like. Materpiscis was probably about 11 inches long, but no one is sure if that was exactly how big it was, because the caudal fin was not preserved. 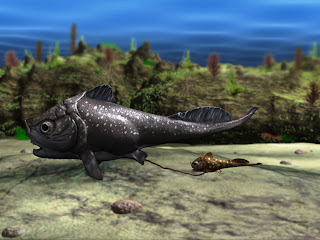 Materpiscis lived in the Devonian Period, and probably constantly had to avoid larger placoderms such as Dunkleosteus. This image shows a female Materpiscis giving birth. Are there any species of fish today that give birth with an umbilical cord? I have never heard of such an animal before.